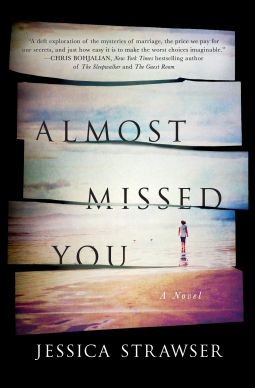 Almost Missed You by Jessica Strawser is a debut novel that packs a punch mainly because of the secrets the characters keep from each other. The story is told from three viewpoints - Violet, Finn and Caitlin. There is also a dual time line. At first I always resent that hop back or forwards, however in this case the transition back in time comes just at the right moment and some of the back story is revealed at the right point. Secrets abound in this story, all of them keep back secrets or have shared the truth with the wrong person. There is a lack of being up front with the person who most deserves and needs it. So while a person might feel they are with the love of their life, just how much do they really know that person. How good is their marriage really? Finn is a tormented character, full of guilt and regret. While he should be someone I really disliked I felt a sympathy for him, although not for his actions. He was definitely in need of deep therapy. Violet was an unsuspecting partner in her marriage, with a blindspot that prevented her from realising some home truths. Her grandmother though was wiser. Caitlyn and George's marriage was interesting and I felt based on love, yet with each harboring secrets that were regrettable and sad. Oh for the truth to have been revealed by each at an earlier date. George was a sort of distant figure in the story, but Caitlyn was very much part of it. I felt sympathy too for her - her panic over what might be revealed, her desire to help Violet. In a way I liked her more than Violet. Once all secrets have been revealed each one makes their necessary choice to move on in life. Marked with suffering, and yet hopefully wiser and ready to embrace the life they now have. YES to liking Caitlyn more than Violet, especially by the end. Thanks for sharing! I loved this book, mostly because I enjoy the emotions aroused by such a book, like frustration with the characters and how they kept making wrong moves. How they finally came forward when it was too late was another mistake. But the characters felt like real people. I got chills just reading the blurb. Sounds sort of sad, though. Great review! I love stories with a dual timeline if they are done well. I read about 120 pages and just couldn't continue. Thanks for sharing, and I am glad you enjoyed the book. Most readers are enjoying it, but not sure it was my mood or just not for me.